Goal Kickers – Johnson 8, Hancock 4, Wilkinson 3, Baxter 2, Ellard 2, Ford 2, Thurlow 2, Doran, Dale, Reeves, Boston. Best Players – Wilkinson, Boston, Fyfe, Johnson, Murdoch, Roos, Thurlow, Hancock, Clayton. 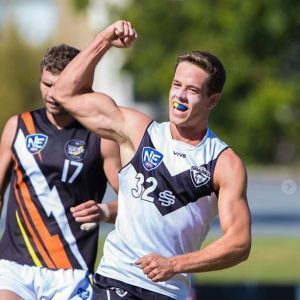 Southport survived an old fashioned shoot out with the NT Thunder at Fankhauser Reserve on Saturday, maintaining top spot on the NEAFL Ladder. The first quarter saw the “Sambono Show” roll into town as NT star Adam Sambono kicked three goals in the first eight minutes of the game. We were well and truly on the back foot and again suffering through inaccurate conversion. Two late goals to Darren Ewing saw NT Thunder lead by seven-points at quarter time. Things changed dramatically in the second term as we slammed on ten goals one to the NT’s solitary goal. Boston, Fyfe and Clayton were dominating the stoppages and Wilkinson’s pressure was super. A seven-point deficit became a 48-point half time lead. A disappointing third quarter saw NT Thunder kick eight straight goals and breathe some life back into the contest. The lead was reduced to 39-points and Steve Daniel let the players know that this game was a long way from over! The lead remained at 38-points midway through the final quarter but up stepped Mitch Johnson who kicked four final quarter goals to ice the game. We head to the SCG this Saturday to take on the Swans, a daunting task at any time, regardless of ladder positions.